Leslie Williams of Integral Coaching Canada recently agreed to help me through some blocks I was encountering in getting my book published. The book is the fruit of my own spiritual journey and my interest in Ken Wilber's integral theory; it recounts my amazing two-year adventure dialoging with a fundamentalist pastor and getting to know second person God. Leslie agreed to meet me between corporate appointments at an Embassy Suites hotel in Herndon, Virginia. We sat in a magnificent atrium aside a waterfall and pond with two full-grown, live swans floating peacefully. Leslie listened intently as I let two years of frustration about publishing roadblocks come tumbling out. Then she told me she was hearing primarily issues from the left-hand quadrants: "I'm frustrated that" or "I'm afraid that" rather than "I can't" or "I don't have the resources to." She suggested the metaphor of a river plunging downstream and encountering boulders. "Let's find out which of these bolders is the main one," she suggested, "so I can get a sense of whether you need a therapist, a spiritual director, a motivational coach, or just somebody to help you get organized. Which of these issues has the most heat?" Leslie actually arranged for a flip chart to be brought to us. As I continued to explore, it became pretty apparent where the heat is, and some of it regards the existential questions explored in the book itself. Was this project, "meant to be," and if so what does that mean? Checking frequently to see if she was on track, Leslie suggested some approaches to each of my issues. And even though the blocks are left-hand (interior), her approaches included right-hand actions: pinning down some people whose offers to help me have been vague and even taking a class in aikido to prepare myself to stay balanced when people attack some of my controversial observations--like the fact that new agers and fundamentalists are actually very close in their experience of how reality works, but their levels of perception cause them to use opposite languaging. Leslie recounted that her own experience in interracial work is that the peacemaker is often shot at from both sides. Leslie also had me draw three concentric circles representing the levels of control I have over each of the issues that is bothering me. She noted that most of my issues are in the outer circle--things I have no control over whatsoever, like whether the book will get the kind of key break that would bring it to the attention of the wide audience I seek to reach. She suggested that given the potential I sense for the book to do good, I need to just keep on moving forward no matter what comes, to "Let go and let God." There was more, a few things I won't share. But the end result was that I felt completely heard and "vibed with." In fact, I smiled later realizing how her JOB as an integral coach is to communicate on my level while seeing things from a broader perspective. Would she have said some of the same things to someone whose book had an opposite premise? As she left me with the swans, I felt clearer, lighter, inspired, and challenged. 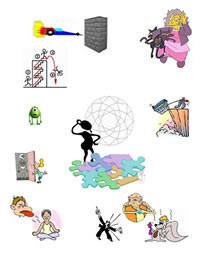 I laughed at myself to hear in my head the theme song to "Man of La Mancha": "And I know, if I'll only be true to this glorious quest..."
I went home and collected clip art to make a collage of how I was feeling. It was extremely satisfying to place each frustration on the periphery with an image in the center of me putting together the puzzle pieces of a multifaceted gem. And then I remembered the last time that two swans had captured my attention. 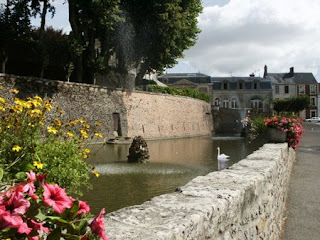 It was last summer when I visited the village of my ancestors in France, Belleme. Two swans have always lived in the moat that surrounds remains of the castle at the top of the hill. And when I saw them last summer 30 years from my prior visit, I felt familiarity with a timeless peace. Then as now, they were a gentle presence, and a beautiful reminder. So I looked at the photo I took of that moat, and noticed the free-flowing fountain at the center of it. In fact, the fountain is spouting right out of that "boulder" in the center. Leslie's approach was exactly what I needed, and in the week that followed, several good things fell into place. I signed on with Intermedia publishers, I got a great review from a fellow integralist, and a journalist friend offered to help make contacts for my marketing plan. I am grateful to Leslie, and to the swans. Arlington is a satellite location of the Alexandria campus of Northern Virginia Community College, (NOVA) located in the Ballston area of Arlington.